Sanskrit characters were born in ancient India and each character embodies the power of the Buddha. 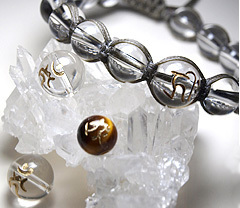 Sanskrit characters were introduced to Japan through Buddhism and have influenced many cultural aspects of Japan.Each Chinese zodiac sign is given a Sanskrit character that acts as a personal talisman, and it is said that placing that Sanskrit (the Buddha in other words) close to you it can increase its power to protect you. 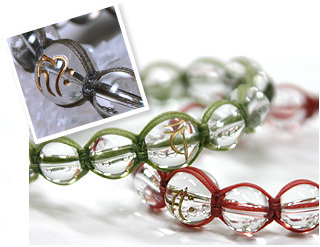 In addition to the meaning and legend, Sanskrit characters are also popular because the characters themselves are attractive.ANAHITA and karasade offer Sanskrit characters in beads. We also have them in straps and bracelets that are widely popular among men and women as amulets that can be carried close to the bearer. These straps and bracelets are created using a variety of combinations, such as using 7 colored beads, personal Chinese zodiac sign or the Sanskrit characters that represent the birth year of a family member and so forth. God/Goddess of Mercy who sees and helps those in trouble and grants all wishes. Bestower of all fortunes and wisdom, particularly improves memory, eliminates bad luck and helps recover from illness. Lord of wisdom and prominent patron of students. Uses the 5-wisdom sword to sever hardship and calamities, and brings good fortunes. Bodhisattva who rides a white elephant and attends to Shaka Nyorai (Sakyamuni) along with Monju Bosatsu (Manjushri Bodhisattva). Prevents all kinds of disasters and hardships, and bestows fortune and longevity for a bright future. Prevents all kinds of disasters and hardships, and bestows fortune and longevity for a bright future. Esoteric, central Mandala deity that represents the cosmos. Prevents all kinds of disasters and hardships, and bestows fortune and longevity to lead one onto a bright path. Takes on severe appearance in order to save people. Burns all obstacles and impurities. Prevents all kinds of disasters and hardships, and bestows fortune and longevity for a bright future. Main deity of the Pure Land and Buddha who saves all.